Hi everyone and welcome to Day 5. As we have done so much work on our blog posts, let's start looking at how we can promote them. You spend a lot of time and effort crafting a few blog posts per week. You take pictures, or buy stock photos and format them. In other words, you put a lot of time, thought, and effort into your blog posts. You hit publish and then you move on to working on the next blog post. If that’s you, there’s a very important step you’re missing – promoting your blog and your blog posts. Getting the word out about the awesome post you’ve just published is just as important as writing it in the first place. In fact, you should be spending more time and effort in the promotion of your posts than you do actually writing them. Here are six different ways to promote your blog posts. The first two are essential and something you should do every single time you hit publish. The rest are things you should do regularly but not necessarily for every single post. The first thing you should do as soon as you publish a new post is share it on your favorite social media sites. Each niche has different sites that work better than others. Figure out where your target market already hangs out and get active there. Be it Facebook, Twitter, Instagram, Pinterest, Tumbler, or any of the other social media sites. Then start sharing your content each time you publish a post. And don’t forget to go back and share older posts as well. Remember that list building is important. Here’s another great instance when having an email list comes in handy. Send out an email about the new blog post to your list. Include a link to it in your weekly newsletter. Add a little info about the topic and a link to your auto-responder messages. In other words, share the post with your subscribers. Not only will you entice them to come back to your blog, there’s also a pretty good chance they will start to share it with their circle of influence. Find a few related blogs and make quality comments on them. In the URL field, link to your new blog post. It’s an easy way to get links and traffic back to your site. It may not be the most effective link building strategy, but it’s easy and a great way to get in front of other bloggers and their audience. As you start to build relationships with other bloggers in your niche and related niches, offer to write guest blog posts for them. Pick one of your more popular or profitable blog posts and use it along with your main blog URL in the author resource box – or even better, work the link to your blog post naturally in the content of your guest post. With Google Hangouts, YouTube, and Facebook, it’s never been easier to get into video content. Record a short video about your blog post and share it along with a link to your post. Don’t forget to invite readers to read the post in your video. Last but not least consider running webinars or recording podcasts to promote your blog and individual blog posts. They are a great way to broaden your reach and get in front of a brand new audience. Of course this isn’t an all-inclusive or even extensive list of things you can do to promote your posts. But it’s a start. Work on these and add other promotional methods as you come across them. Your homework is to start promoting yourself! Try and spend some time promoting your blog posts. Pick a few methods and see what works for you, in your niche. Decide on your favourite social media sites. Start making a checklist of the times you will promote your posts on your social media sites. Write a draft email you will use to send the details of your new post to your list. Make a list of great blogs within your niche where you can add your comments. 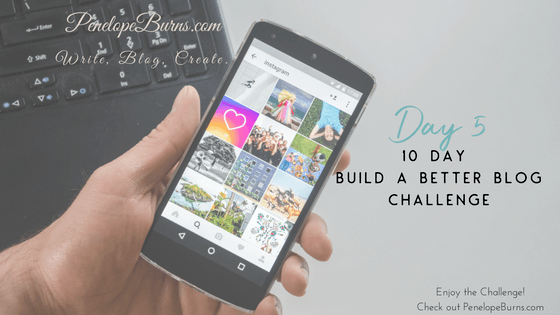 Start building relationships with other bloggers. Look out for Facebook groups. Decide if you want to start recording video. Ensure you have the technology to do it professionally. Draft some phrases you will use for your videos like the same opening and closing comments. Decide if you want to start doing webinars. Ensure you have the technology to do it professionally. Decide if you want to a podcast. Ensure you have the technology to do it professionally. If yes to any of the above, plan how you will publicise your content. So, this is your tip for Day 5. Give it a try and see what you can do to promote your posts. Let us know what works for you.